Enchoro Wildlife Camp-- A luxury Tented Lodge and Camp in the Maasai Mara Kenya “The Place to Stay”. Accommodations of our luxury large spacious tents with spacious changing room and lockers for guests valuables, a writing desk with foldable safari chairs and magazines to keep you entertained. The tent canvas wall front can be opened completely to allow an open view from the sleeping and bathroom areas. Relax on the balcony with safari foldable camp chairs and a circular wooden table where you can sit and watch wildlife roaming in the bush. Our guest suite facilities include king size double beds and singles, all with ensuite bathrooms with flash toilets and showers, sinks, mirror and sufficient lighting. We provide both hot and cold water throught the day, water is harvested from our well source and pumped to our safe storage tanks, generator for lighting and charging your cameras or cell phones for free our security is sufficient and reliable. There’s plenty of parking. Welcome to the Enchoro Wildlife Camp Website which will provide you with key information about our Accommodation and other services that will facilitate travelers of all walks of life in choosing the best tourist programs around the Mara region, and to promote tourism as well as to provide people with quality adventure holidays, with its superb accommodations and food. Enchoro Wildlife Camp is also an affiliate of the Youth Hostels Network in Kenya and it is located on the slopes of the Oloolaimutia Hills in the Maasai Mara. If you are interested in planning a wonderful and remarkable tour in the Mara region, this is no longer a problem; it is now easier as enchoro camp will help you manage everything. If you are enticed by Volunteerism, wildlife Safaris, walking & trekking, this will ensure that our visitors gain local knowledge and at the same time, the local community economies will also earn from it. “Go direct to enchoro, Save Money and give more back” This philosophy guide’s enchoro wildlife camp with its product and service development. 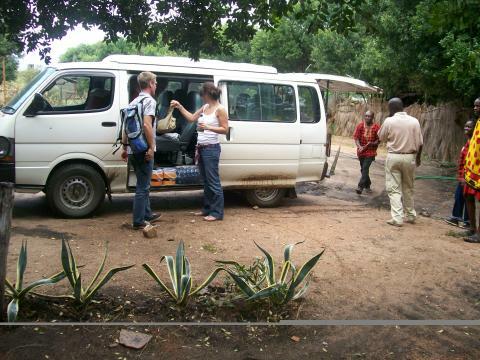 Enchoro offers a lot of direct booked adventure tours and holidays accompanied with a comprehensive route plan, Trip information, clearly marked tour durations, and give back to the Masai communities through volunteer program plan activities. Our volunteer options are planned to suite Group travels, Families or individual options enabling every individual to choose from several activities which they can do during their trip. The Enchoro Wildlife Camp is situated in a quiet environment, perfect for guests wishing to have a quality time of retreat and relaxation. Also a base for safari destinations to the neighborhood Masai Mara National Game Reserve lately referred to as the new wonders of the world. Our Camp is surrounded by a natural environment, waking up to bird twitter and sometimes roaring of lions, hyena’s monkeys drama in the bush around. The Enchoro Wildlife Camp in the Maasai Mara is a perfect lodge with a modern touch, all of our eleven accommodation suites are designed to match with the surrounding environment, Accommodations of our luxury large spacious tents with spacious changing room and lockers for guests valuables, a writing desk with foldable safari chairs and magazines to keep you entertained. From street cafeteria’s to casual dinning to the most extravagant fine dinning experiences,Enchoro offers an extraordinary variety of local and international tasty finger liking cuisines, buffets lunches & Dinners,BBQ Buffets or alacate. A very spacious dinning room also serve as a meeting room convenient for all kinds of meetings, Training seminars, conferences, Retreats, product lunch, weeding receptions, birthday parties, corporate meetings, corporate and social Get-To-Gethers and many more. While at Enchoro you can as well take advantage of the opportunities to engage yourself with making a difference to the lives of people in the area. Enchoro is strictly committed to its policy regarding responsible tourism and thus, it chooses to work with those local Masai organized groups of Men, Women and Youth that offer and represent the local communities with great long term benefits that maintain the welfare of the preservation of their environment, culture, believes and traditions. This however develops relationships across with the goal to promoting better understanding between foreign tourists and the Masai communities while freely interacting, sharing of cultural social practices and their traditions. We do all kinds of tailor made excursions, game drives with safari vehicle or 4x4 wheel drive, hot air balloon safaris, Bush walking safaris, Hiking, Masai traditional dances, visit to Maasai village and get the real touch with the Maasai culture & traditions as well as giving a helping hand to volunteer work and community service like tree planting with the Maasai people. Enchoro Camp is simply in the best location of Masai Mara’s Oloolaimutia gate to the world renowned and one of the best Game reserve. ‘Maasai Mara’ referred to as the new Wonders of the World. It offers panoramic views of Oloolaimutia hills on the East gate of the Maasai Mara Game Reserve. Maasai Mara Game reserve, Africa’s greatest wildlife reserve presently rated as the New Wonders of the World the home of Africa wildcats and big five is located 270 km away from Nairobi in the south Rift. Easily accessible by road, you are able to view plenty of things along the way and also make stop over .Highway signs on the location and distance from one town to the next is posted.